2015 TOWLE 16th ANNUAL CELTIC STERLING SILVER CHRISTMAS ORNAMENT. The Celtic pattern was first introduced by Towle in 1979. With a broad flat Celtic knot, this ornament design is distinctive and unique, working well with many styles of décor. The 2015 Sterling Silver Celtic Ornament is the 16th edition in this annual series from Towle. This limited edition collectible is a beautiful adornment for any tree or mantelpiece. Includes the gift box, protective felt pouch and is dated with the year 2015. Dual sided Celtic ornament measures 3 1/2 X 3 1/2 inches. Start a new collection as a thoughtful gift for a collector, newlywed, or for yourself with this eleventh issue sterling ornament. This is BRAND NEW with original box, pouch, romance card, hanging ribbons and outer sleeve. If by some small chance your item is not satisfactory, your return should still be received within 7 days or less. Be sure to check my other listings for more 2010 ornaments plus many other Christmas sterling pendant /medallion / ornament / charms, and other great gift items, Victoriana, Elegant Glassware, Vintage Clothes and Shoes etc. 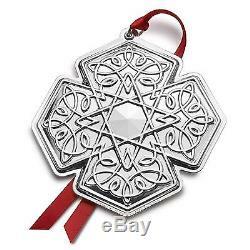 The item "2015 Towle 16th Annual Celtic Sterling Silver Xmas Ornament Pendant Medallion" is in sale since Saturday, August 01, 2015. This item is in the category "Collectibles\Holiday & Seasonal\Christmas\ Modern (1946-90)\Ornaments\Metal".